Maybe someday chestnuts from trees bred to be 15/16 (94 percent) American chestnut and 1/16 blight-resistant Chinese chestnut will be planted in the woods and sprout to produce trees that survive the blight. Did you know that it’s still possible to see American chestnut trees in our local woods, even though the blight that doomed North America’s mighty chestnut trees first struck more than a century ago? These chestnut trees we can see in the woods today are no longer mighty. They’re what is left over from the American chestnuts (Castanea dentata) that were struck down. They’re saplings that sprout from the living roots of long-gone trees. The roots are resistant to the blight and persist, continuing to send up new shoots. Typically the trees that sprout from them grow to about 15-20 feet tall and several years of age and then they, too, are stricken with the blight and die. You can sometimes find these small chestnut trees next to trails, for example, at Bowman Conservation Area or Headwaters Conservation Area. The tallest ones are usually dead or dying, but near the dead pole, you’ll often see other small chestnut trees that have sprouted from the same very old root system. Check out the chestnut leaves. They’re long and narrow (about 5-8 inches long and 1.5-3.5 inches wide) with a pointed tip and pointed triangular teeth on the edges. (They look somewhat like beech leaves, but beech leaves are more oval and not so long and skinny.) Autumn turns them yellow and then brown. Chestnut blight (Cryphonectria parasitica) is a fungus that infects the inner, living bark of American chestnut trees. It causes cankers, and over time the bark cracks and splits off the tree. Eventually the fungus completely girdles the tree, interrupting the flow of nutrients throughout the tree, so the tree dies. This happens to the chestnut trees that grow from old roots, usually before the tree is mature enough to produce nuts. The blight arrived in this country around 1904 from Asia, and our native American chestnut trees were not resistant to it. The blight was spread at first by a native chestnut bark beetle, which makes holes in bark for laying its eggs. Wind, other insects, and birds also spread the blight’s spores. By the 1950s, the blight had wiped out 99 percent of American chestnut trees, which had previously been dominant in eastern hardwood forests, where they typically grew to 80 feet tall and 3 feet in diameter and accounted for about 25 percent of the trees in the forests. Today, oaks are usually dominant in what remains of those forests. In homes or barns built more than 100 years ago, before the blight arrived in our area, homeowners today may still be able to find beams of chestnut (look in the basement or attic). Chestnut wood is very durable and was widely used in construction as well as for fences, furniture, musical instruments, barrels, telephone poles, and railroad ties. Chestnut trees were also a major source of tannin, used in tanning leather. A few of the American chestnuts that sprout from roots live long enough to bloom and may even produce some nuts. At the edges of the woods around the Boroughs branch of the YMCA, you might notice blossoming chestnuts in late June or early July. They have white, finger-like clusters of male blossoms (catkins) that you can see from a distance at that time. Are the horse-chestnut trees (Aesculus hippo-castanaum) that we see in town similar to American chestnuts? (A horse chestnut stands at the intersection of Chestnut Street and West Main Street. There’s another on West Street, and a couple in Westborough’s historic Memorial Cemetery.) The nuts of horse chestnut are inedible and are larger and look somewhat similar to the nuts of American chestnut. American chestnuts served as food for people of earlier generations, as well as for livestock (especially pigs) and wildlife such as wild turkeys, deer, squirrels, and bears. Make no mistake – the two trees are not closely related. They are in different families. Horse chestnuts are non-native but have been planted here as street trees and ornamentals. Horse chestnut leaves (with 5-7 leaflets arranged like the fingers on a hand) and blossoms are very different from those of true chestnuts. Where do the chestnuts that we can buy in supermarkets at Thanksgiving and Christmas time come from? 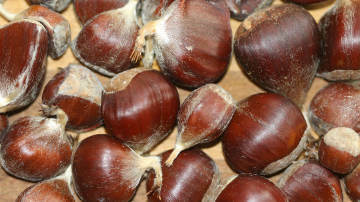 Italy, China, and Korea are the main exporters of chestnuts to the U.S. Chestnut trees growing in yards are usually Chinese chestnuts (Castanea mollissima). They are blight resistant. Their leaves and other characteristics are slightly different from those of American chestnuts. Is there hope for restoring healthy American chestnut trees to our forests someday? The American Chestnut Foundation (TACF) has been working toward this end since its founding in 1983. Most promising is its program of back-crossing American chestnuts with Chinese chestnuts (Castanea mollissima), which have genes that confer some resistance to the blight. The goal is to produce trees with the characteristics of American chestnuts but also the resistance of Chinese chestnuts. Now, after breeding seven generations in its program, TACF is working with seedlings that are 15/16 (94 percent) American chestnut and 1/16 Chinese chestnut. Recently, 1,250 such seedlings were planted in Westborough on state land near the new Mass Fish & Wildlife headquarters. More have been planted at other locations in Massachusetts and Rhode Island. Eventually some of these trees will produce seeds for planting in Massachusetts forests to begin the American chestnut restoration.